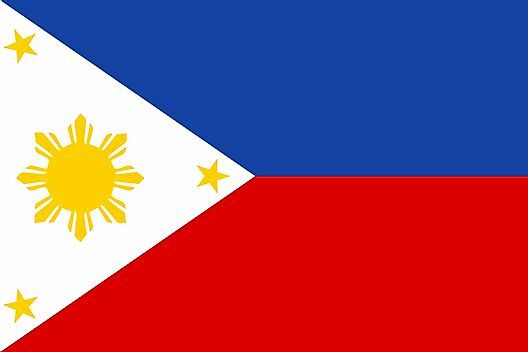 The Philippines flag was officially adopted on May 19, 1898. The white triangle is symbolic of peace, red symbolizes bravery and blue represents patriotism. The three gold stars and sun represent the three main divisions of the country - Luzon, Mindanao and Visayas. 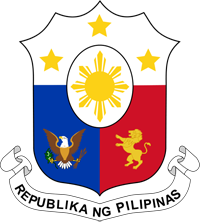 The coat of arms of the Philippines is composed of a shield depicting sun and stars (transposed from the flag). The eagle of the United States on the field of blue, and the lion of Castile and Leon on the field of red, represent the colonial history of the Philippines.